Carol F. McCabe, Esq. and Claudia V. Colón, Esq. During his first year in office, President Trump signed executive orders declaring his intent to dismantle environmental rules, with the goal of easing regulatory burdens on industry, boosting economic growth, and gaining energy independence. As we predicted in our Forecast for 2018, EPA took several significant actions in furtherance of these goals last year, including, for example: formally proposing a new rule to replace the Obama-era Clean Power Plan; announcing revisions to several regulations in line with the Administration’s support for reviving the coal industry (e.g. relaxing New Source Performance Standards (NSPS) rules for coal plants and requirements for coal ash disposal); and, proposing a new rule limiting the scope and application of the “Waters of the United States” (WOTUS) rule. This year, we can expect EPA’s regulatory rollbacks to continue, but not without fervent challenges from environmental advocacy groups and heavy oversight from the newly-Democrat House of Representatives. Below are some significant Clean Air Act, Clean Water Act, Budgetary, Enforcement and Personnel issues that EPA will be facing this year. 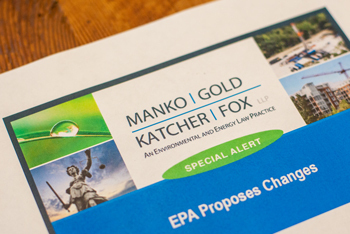 Superfund, hazardous waste, New Source Review, Renewable Fuel Standards and Endangered Species Act developments are addressed by separate articles in the MGKF 2019 Environmental and Energy Law Forecast. In the summer of 2018, EPA issued its long-anticipated proposal to replace the Clean Power Plan, named the Affordable Clean Energy (ACE) rule. The proposed ACE rule is based on several key differences from its predecessor; most importantly, the rule defines the “best system of emissions reduction” for greenhouse gas emissions from existing power plants as on-site, heat-rate efficiency improvements. The ACE rule contains a list of candidate technologies that states would consider in establishing standards of performance for existing plants. The proposed ACE rule also contains provisions that would allow for a new preliminary applicability test for determining whether a physical or operational change made to a power plant may be a “major modification” triggering New Source Review; and new implementing regulations for emissions guidelines under Clean Air Act section 111(d). The proposed rule is thus markedly different from the Clean Power Plan, including with respect to its quantification of the costs and benefits of the rule. EPA estimates that replacing the Clean Power Plan with the ACE rule could result in $3.4 billion in net benefits, including $400 million annually. While EPA estimates that the proposed ACE rule would reduce CO2 emissions in 2025 by between 13 and 30 million short tons, the Trump administration has downplayed the threat of climate change. Indeed, the President expressed his disagreement with the conclusions of the National Climate Assessment report findings released in November of 2018, which warned that the U.S. could face hundreds of billions of dollars in the coming decades from climate impacts. While EPA plans to finalize the ACE rule this spring, the Agency has received extensive public comment on the proposal, including by states and environmental groups that will likely challenge the rule. In late 2018, EPA issued a proposed rule that would ease the NSPS for greenhouse gas emissions from new, modified, and reconstructed coal-fired power plants by undoing its prior determination that carbon capture and storage (CCS) constitutes the “best system of emission reduction” for new plants. Instead, due to the high cost and limited geographic availability of CCS, EPA proposed that CO2 limits for new sources should be based on the most efficient demonstrated steam cycle in combination with the best operating practices. Another EPA proposal issued in December of 2018 would revise the cost-benefit analysis justifying the mercury restrictions in the Obama-era Mercury and Air Toxics Standards (MATS) rule, finding that the costs to industry of complying with the rule (estimated at $7.4 million to $9.6 million annually) heavily outweighed the quantifiable benefits of the rule (estimated at $4 million to $6 million annually). Notably, EPA’s revised cost-benefit analysis excluded consideration of co-benefits of the rule associated with reduction of pollutants other than mercury, such as particulate matter. Representatives of the utility sector, however, have asked for the rule to be left as is, since some coal plants have already spent billions in compliance costs. Earlier in 2018, EPA also issued the first of a planned two-part final rule intended to provide more flexibility to states and regulated facilities in the management of coal ash. In 2015 when the coal ash rule was finalized, multiple lawsuits were filed by both industry and environmentalists. Last August, shortly after EPA issued its proposed rule, the U.S. Court of Appeals for the D.C. Circuit sided with environmental groups by rejecting industry claims that the rule went too far and finding that the Obama-era rules did not go far enough, concluding that the rule did not require sufficient protections for unlined and partially-lined pits, and that some storage facilities had been improperly exempted. While it remains to be seen whether the D.C. Circuit’s ruling will undermine the Agency’s new proposal, environmental groups promptly challenged the new rules in the D.C. Circuit. The WOTUS rule would exclude from the definition of “water of the United States,” ephemeral features that contain water only during or in response to rainfall, groundwater, ditches that do not meet the criteria necessary to be considered jurisdictional, prior converted cropland used in support of agricultural purposes, certain stormwater control features contracted in upland areas, certain wastewater recycling structures constructed in upland areas, and certain wastewater treatment systems. All in all, the agencies were seeking to offer clarity with the new rule, which they hope to achieve by removing the case-by-case reliance on Justice Kennedy’s “significant nexus” test and providing clear-cut definitions of which waters are and are not covered. While the comment period for the rule will remain open for 60 days after publication, the rule has already been met with strong reactions and will likely garner significant comment from states, environmental groups, agricultural interests, and the industrial and development sectors. As to EPA’s budget, although the Trump Administration announced steep budget cuts for the Agency last year, those cuts have not been implemented. There have been some funding cuts, however, as the Office of Management and Budget shows spending by the EPA at $8.725 billion in 2016; $8.165 billion in 2017; and an estimated $7.916 billion in 2018. EPA’s FY 2019 budget of $6.146 billion represents a further reduction from the previous year, while intended to ensure that the Agency will deliver on its goals of providing Americans with clean air, land, and water; ensuring chemical safety; promoting cooperative federalism; and administering the law in order to refocus the Agency on its statutory obligations as intended by Congress. Although EPA’s FY 2018 enforcement results have not yet been published, some independent analysts have concluded EPA reduced its efforts in 2018. For example, the Environmental Data and Governance Initiative, an advocacy group formed by university researchers, has concluded that EPA’s enforcement activity steeply declined between 2017 and 2018, with 54 settled criminal cases in 2018, as compared to 87 in 2017, 81 in 2016, and more than 100 in every year between 2010 and 2015. On the civil enforcement front, the group also noted declines in the use of enforcement tools such as administrative penalty orders, administrative compliance orders, consent decrees, and Superfund administrative orders for cost recovery. Last July former Administrator Scott Pruitt resigned over a slew of spending and ethics scandals, and was replaced by Andrew Wheeler, a former coal industry lobbyist, as Acting Administrator. President Trump officially nominated Wheeler for the full-time post on January 9, pending confirmation from the Senate. In addition to the rulemaking activities discussed above, Wheeler continues former Administrator Pruitt’s emphasis on addressing Superfund cleanups. Indeed, on November 20, 2018, EPA released a third revision to the Administrator’s Emphasis List of Superfund Sites Targeted for Immediate, Intense Action. Administrator Wheeler has also announced that he intends to continue Pruitt’s plan to pursue the controversial “science transparency” rule, which would require EPA to use peer-reviewed and reproducible scientific data and information where available, and ensure the regulatory science underlying its actions is publicly available. The Agency is now reviewing the almost 600,000 comments received on the proposed rule. Finally, in the midst of EPA’s regulatory rollback and other activities that will surely face scrutiny from states and environmental advocacy groups as we saw in 2018, we can also expect increased oversight from the Democrat majority in the House of Representatives in 2019. Party leaders in the House have identified climate change as a top priority for their terms, which may result in more aggressive oversight over any changes to rules affecting greenhouse gas emissions. Indeed, House Speaker Nancy Pelosi has revived the Select Committee on Energy Independence and Global Warming, which was eliminated in 2010 after Republicans took over the House. Representative Frank Pallone, D-NJ, will lead the House Energy and Commerce Committee, which could play a central role in scrutinizing the Trump administration’s regulatory rollbacks.